Heat oven to 425°F. Place potatoes in large bowl of cold water. Grease bottom and sides of 10-inch nonstick ovenproof skillet with 1 tablespoon of the butter. Spray 12x12-inch piece of foil with cooking spray. In 1-quart saucepan, heat remaining 4 tablespoons butter, the thyme and garlic over medium heat 1 to 2 minutes, stirring constantly until butter is melted but garlic has not browned. Remove from heat; set aside. In custard cup, combine salt and pepper. Drain potato slices; pat dry between paper towels. Starting in center of pan, arrange 1/4 of potato slices, slightly overlapping in circular pattern, covering bottom of pan. Brush with 1/4 of butter mixture; sprinkle with 1/4 teaspoon of the salt mixture. Sprinkle with 2 tablespoons of the Parmesan cheese. Repeat layers two more times, ending with cheese. Top with one more layer of potatoes, brush with remaining butter and sprinkle with remaining salt mixture. Press top of potatoes firmly with metal spatula. Cook uncovered over medium-high heat 5 minutes, gently shaking pan occasionally to prevent potatoes from sticking. Cover with foil, sprayed side down. Bake 15 minutes. Remove foil; bake an additional 20 to 25 minutes or until potatoes are tender and golden brown. Remove from oven. Run small spatula around edge of potatoes; gently shake pan to loosen potatoes from bottom of pan. 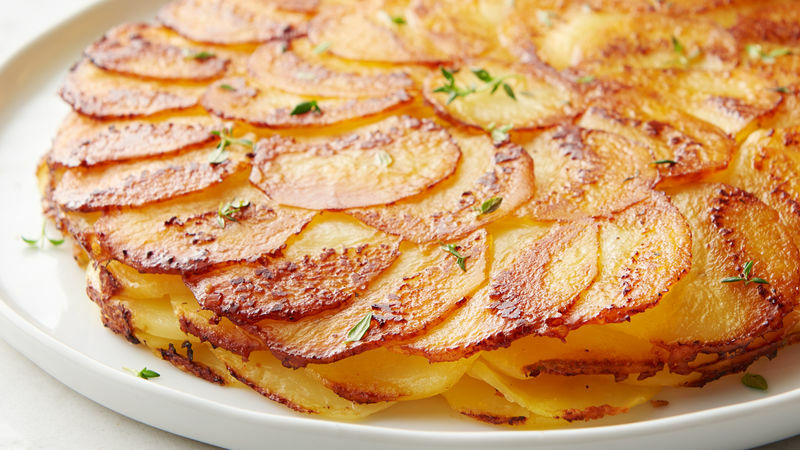 Carefully invert potatoes onto serving plate To serve, cut into wedges. If you prefer extra-crispy potatoes, invert the potatoes onto a cookie sheet. Bake 5 to 7 minutes before cutting.